Entering the bustling Flat Iron Square, one can quickly become overwhelmed by the sheer range of food and beverages being offered at a wide variety of stalls nestled under the train tracks headed to nearby London Bridge. Luckily for us, a red neon sign displaying a single word ‘Pizza’ guided us to Baz & Fred. 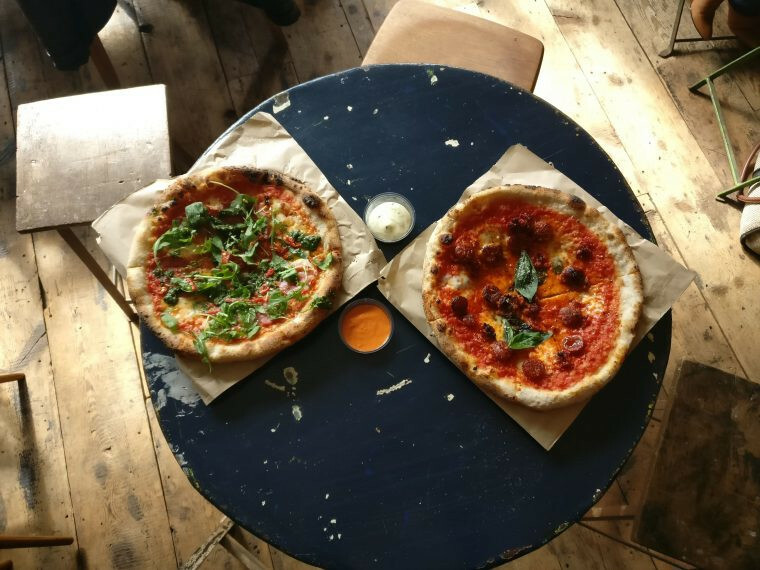 Six Roman-style stone baked pizzas are on the menu, ranging from mozzarella to the delicious chorizo nduja. The pizzas are then prepared before your eyes, with plenty of tossing and throwing of dough to excite the appetite and entice passers-by. This permanent stall is, in fact, a new addition to their business, Baz & Fred have been running a mobile catering business since 2012 which provides for weddings and private hire. A particularly unique aspect of Baz & Fred is their pizza oven. The two racks of 4 mini ovens would not look out of place in a sci-fi movie’s canteen and are in fact designed by artist Daniel Chadwick (who is also godfather to Baz). 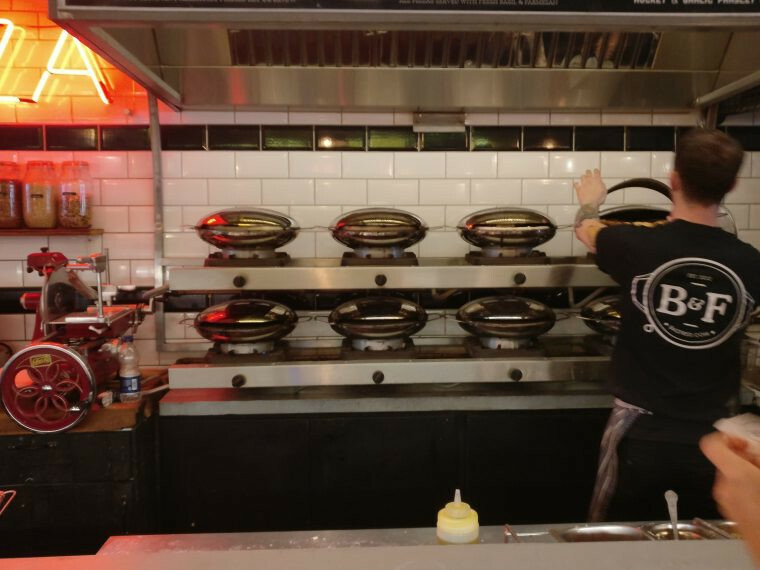 These ovens are able to reach the same temperatures as traditional wood-fired ovens and certainly provide an entertaining experience for the punter, who can watch their pizza being birthed from a silver orb. The pizzas themselves live up to the hype of the preparation. The Napolitano salami was well seasoned with pesto, rocket and chilli – the latter giving a powerful kick which lingered on to the next mouthful. 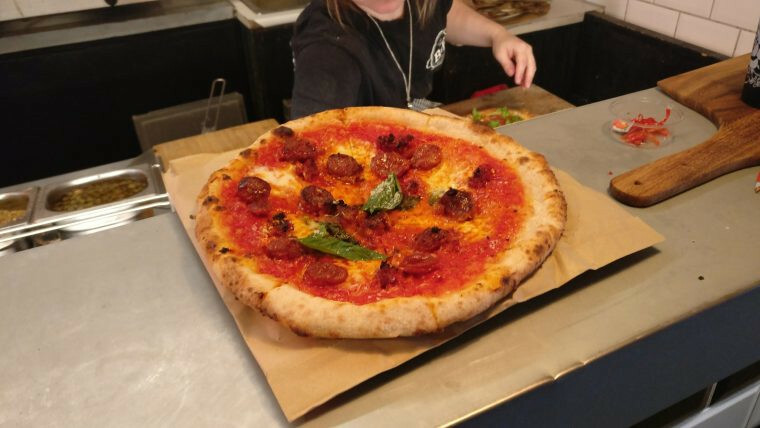 The chorizo nduja packed a pleasant punch, the chorizo was meaty and flavoursome and the tomato sauce was excellent. Every pizza is accompanied by a delicious garlic mayo, which was the perfect companion to those last few pieces of crust. If one is in the Borough area and requires a hearty pizza in a convivial atmosphere, Baz & Fred is a good call.